Sunnyvale, Calif. – October 25, 2012: Vitria Technology, Inc., the Operational Intelligence Company, today announced that Corextrad, a French service bureau based in Martinique, has selected the Vitria Operational Intelligence platform to present a holistic view of service operations to its customers. With a common operating picture delivered by Vitria through its Web dashboards, Corextrad will provide KPI and SLA monitoring and management to its end customers using real-time data. Corextrad’s retail, logistics and transportation customers were having difficulty gaining visibility into their supply chain as their data resided in multiple systems and silos. 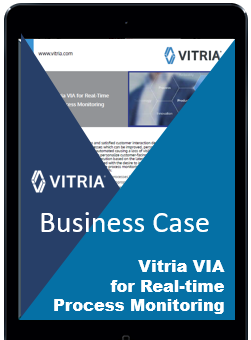 Vitria’s unified Operational Intelligence platform enables Corextrad to address these issues through event correlation, real-time monitoring and guided workflow automation. After an evaluation of multiple technologies, Corextrad turned to Vitria Operational Intelligence to deliver track-and-trace modeling of business processes as they exist in the enterprise as well as real-time status and decision support and live dashboards that enable corrective action. Additionally, Corextrad required a solution that could seamlessly integrate with its existing enterprise service bus. With Vitria Operational Intelligence, organizations reach business performance and efficiency levels that were previously unattainable. Vitria’s live dashboards empower business and IT users to immediately act on real-time information with the touch of a button, leveraging the power of Operational Intelligence. To learn more about Vitria’s Operational Intelligence solution for supply chain logistics, please contact mailto:info@vitria.com. Corextrad provides added-value IT Services (EDI, Value-Added Network, e-invoicing, Business Process Outsourcing) in the French West Indies islands of Martinique, Guadeloupe and French Guyana territory and helps customers in retail, logistics, transportation and automotive.